Histidine (symbol His or H) is an α-amino acid that is used in the biosynthesis of proteins. It contains an α-amino group (which is in the protonated –NH3+ form under biological conditions), a carboxylic acid group (which is in the deprotonated –COO− form under biological conditions), and an imidazole side chain (which is partially protonated), classifying it as a positively charged amino acid at physiological pH. Initially thought essential only for infants, longer-term studies have shown it is essential for adults also. It is encoded by the codons CAU and CAC. Histidine, also referred to as L-histidine, is an essential amino acid that is not synthesized de novo in humans. Humans and other animals must ingest histidine or histidine-containing proteins. The biosynthesis of histidine has been widely studied in prokaryotes such as E. coli. Histidine synthesis in E. coli involves eight gene products (His1, 2, 3, 4, 5, 6, 7, and 8) and it occurs in ten steps. This is possible because a single gene product has the ability to catalyze more than one reaction. For example, as shown in the pathway, His4 catalyzes 4 different steps in the pathway. Histidine is one of the amino acids that can be converted to intermediates of the tricarboxylic acid (TCA) cycle. Histidine, along with other amino acids such as proline and arginine, takes part in deamination, a process in which its amino group is removed. In prokaryotes, histidine is first converted to urocanate by histidase. Then, urocanase converts urocanate to 4-imidazolone-5-propionate. Imidazolonepropionase catalyzes the reaction to form formiminoglutamate (FIGLU) from 4-imidazolone-5-propionate. The formimino group is transferred to tetrahydrofolate, and the remaining five carbons form glutamate. Overall, these reactions result in the formation of glutamate and ammonia. Glutamate can then be deaminated by glutamate dehydrogenase or transaminated to form α-ketoglutarate. Histidine can be converted to 3-methylhistidine, which serves as a biomarker for skeletal muscle damage, by certain methyltransferase enzymes. The Food and Nutrition Board (FNB) of the U.S. Institute of Medicine set Recommended Dietary Allowances (RDAs) for essential amino acids in 2002. For histidine, for adults 19 years and older, 14 mg/kg body weight/day. ^ Kopple, J D; Swendseid, M E (1975). "Evidence that histidine is an essential amino acid in normal and chronically uremic man". Journal of Clinical Investigation. 55 (5): 881–91. doi:10.1172/JCI108016. PMC 301830. PMID 1123426. ^ Vickery, Hubert Bradford; Leavenworth, Charles S. (1928-08-01). "ON THE SEPARATION OF HISTIDINE AND ARGININE IV. THE PREPARATION OF HISTIDINE". Journal of Biological Chemistry. 78 (3): 627–635. ISSN 0021-9258. ^ Roberts, John D. (2000). ABCs of FT-NMR. Sausalito, CA: University Science Books. pp. 258–9. ISBN 978-1-891389-18-4. ^ Mrozek, Agnieszka; Karolak-Wojciechowska, Janina; Kieć-Kononowicz, Katarzyna (2003). "Five-membered heterocycles. Part III. Aromaticity of 1,3-imidazole in 5+n hetero-bicyclic molecules". Journal of Molecular Structure. 655 (3): 397–403. Bibcode:2003JMoSt.655..397M. doi:10.1016/S0022-2860(03)00282-5. ^ Wang, Lijun; Sun, Na; Terzyan, Simon; Zhang, Xuejun; Benson, David R. (2006). "A Histidine/Tryptophan π-Stacking Interaction Stabilizes the Heme-Independent Folding Core of Microsomal Apocytochrome b5Relative to that of Mitochondrial Apocytochrome b5". Biochemistry. 45 (46): 13750–9. doi:10.1021/bi0615689. PMID 17105194. ^ Blessing, Robert H.; McGandy, Edward L. (1972). "Base stacking and hydrogen bonding in crystals of imidazolium dihydrogen orthophosphate". Journal of the American Chemical Society. 94 (11): 4034–4035. doi:10.1021/ja00766a075. ^ Katoh, Ryuzi (2007). "Absorption Spectra of Imidazolium Ionic Liquids". Chemistry Letters. 36 (10): 1256–1257. doi:10.1246/cl.2007.1256. ^ A. Robert Goldfarb; Saidel, LJ; Mosovich, E (1951-11-01). "The Ultraviolet Absorption Spectra of Proteins". Journal of Biological Chemistry. 193 (1): 397–404. PMID 14907727. ^ a b Ingle, Robert A. "Histidine Biosynthesis". The Arabidopsis Book. 9: e0141. doi:10.1199/tab.0141. PMC 3266711. PMID 22303266. ^ a b Alifano, P; Fani, R; Liò, P; Lazcano, A; Bazzicalupo, M; Carlomagno, M S; Bruni, C B (1996-03-01). "Histidine biosynthetic pathway and genes: structure, regulation, and evolution". Microbiological Reviews. 60 (1): 44–69. ISSN 0146-0749. PMC 239417. PMID 8852895. ^ a b Kulis-Horn, Robert K; Persicke, Marcus; Kalinowski, Jörn (2014-01-01). "Histidine biosynthesis, its regulation and biotechnological application in Corynebacterium glutamicum". Microbial Biotechnology. 7 (1): 5–25. doi:10.1111/1751-7915.12055. ISSN 1751-7915. PMC 3896937. PMID 23617600. ^ Adams, E. (1955-11-01). "L-Histidinal, a biosynthetic precursor of histidine". The Journal of Biological Chemistry. 217 (1): 325–344. ISSN 0021-9258. PMID 13271397. ^ "Understanding Genetics". genetics.thetech.org. Retrieved 2016-05-19. ^ Stepansky, A.; Leustek, T. (2006-03-01). "Histidine biosynthesis in plants". Amino Acids. 30 (2): 127–142. doi:10.1007/s00726-005-0247-0. ISSN 0939-4451. PMID 16547652. ^ Cheng, Yongsong; Zhou, Yunjiao; Yang, Lei; Zhang, Chenglin; Xu, Qingyang; Xie, Xixian; Chen, Ning (2013-05-01). "Modification of histidine biosynthesis pathway genes and the impact on production of L-histidine in Corynebacterium glutamicum". Biotechnology Letters. 35 (5): 735–741. doi:10.1007/s10529-013-1138-1. ISSN 1573-6776. PMID 23355034. ^ Coote, J. G.; Hassall, H. (1973-03-01). "The degradation of l-histidine, imidazolyl-l-lactate and imidazolylpropionate by Pseudomonas testosteroni". Biochemical Journal. 132 (3): 409–422. doi:10.1042/bj1320409. ISSN 0264-6021. PMC 1177604. PMID 4146796. ^ Mehler, A. H.; Tabor, H. (1953-04-01). "Deamination of histidine to form urocanic acid in liver". The Journal of Biological Chemistry. 201 (2): 775–784. ISSN 0021-9258. PMID 13061415. ^ Andersen, Hjalte H.; Elberling, Jesper; Arendt-Nielsen, Lars (2015-09-01). "Human surrogate models of histaminergic and non-histaminergic itch" (PDF). Acta Dermato-Venereologica. 95 (7): 771–777. doi:10.2340/00015555-2146. ISSN 1651-2057. PMID 26015312. ^ "3-Methylhistidine". HMDB Version 4.0. Human Metabolome Database. 20 December 2017. Retrieved 25 December 2017. ^ Derave, Wim; Everaert, Inge; Beeckman, Sam; Baguet, Audrey (2010-03-01). "Muscle carnosine metabolism and beta-alanine supplementation in relation to exercise and training". Sports Medicine. 40 (3): 247–263. doi:10.2165/11530310-000000000-00000. hdl:1854/LU-897781. ISSN 1179-2035. PMID 20199122. ^ Fahey, Robert C. (2001). "Novelthiols Ofprokaryotes". Annual Review of Microbiology. 55: 333–56. doi:10.1146/annurev.micro.55.1.333. PMID 11544359. 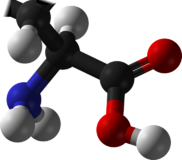 Wikimedia Commons has media related to Histidine. This page was last edited on 5 December 2018, at 03:26 (UTC).